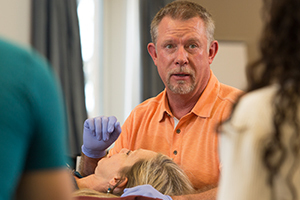 San Marcos, California—May 6, 2015—The Continuing Professional Education program at the University of St. Augustine for Health Sciences has been reaccredited for five years by the International Association for Continuing Education and Training (IACET). IACET sets the standard for excellence in continuing education with its rigorous reaccreditation process. The University of St. Augustine offers more than 100 specialty certifications, in-person seminars nationwide and pre-recorded webinars for physical therapists, occupational therapists, athletic trainers, physical therapy assistants, occupational therapy assistants and other healthcare providers. Attendees can earn continuing education units (CEUs) they may be able to apply toward the licensure requirements in their profession. Review the full list of Continuing Professional Education seminars. Animal-Assisted Therapy: Improving Treatment Outcomes, which covers the use of a goal-directed treatment with an animal used as a key part of the process. 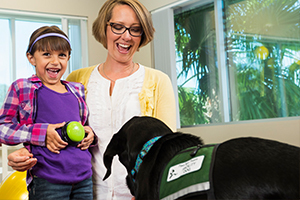 This in-person seminar explores the history, theory and research outcomes related to animal-assisted therapy, and the use of dogs as therapeutic tools. Watch a video about the seminar below. Exercise Strategies and Progression for Musculoskeletal Dysfunction, which shares exercise strategies for conditions that affect the spine and limbs and are commonly encountered in an outpatient orthopaedic clinic. The exercise interventions are grounded in current research and i mmediately applicable to participants’ work in the clinic. The University of St. Augustine for Health Sciences (USA) is a graduate institution that emphasizes health science education through innovative quality classroom and distance education. Founded in 1979, USA has locations in San Marcos, California; St. Augustine, Florida; and Austin, Texas. USA offers degree programs in physical therapy, occupational therapy, athletic training, education and health science, as well as residency, fellowship and continuing education programs. For more information, visit www.usa.edu. USA is a member of Laureate International Universities, a network of more than 80 institutions in 29 countries and one of the most significant global higher education providers for health sciences. For more information, visit www.laureate.net.